Fresh off her 1000m SA record, Caster Semenya will be chasing the women’s 1500m South African record at the Dal Josaphat Stadium in Paarl on Thursday, 22 March 2018 at the third and final Liquid Telecom Athletix Grand Prix Series Meeting. In fine form, Semenya broke the 35-year-old record of Ilse de Kock Wicksell on Thursday, 08 March at the second Grand Prix Meeting at Tuks. She will face USA-based Dominique Scott in the 1500m at the 3rd and final Meeting in Paarl. Scott won the SA 5000m title on Thursday 15 March, clocking 16:55.05. Semenya has already come close to the SA record of 4:01.81, set as far back as 1984 by Zola Budd-Pieterse when she clocked 4:01.99 in Durban on 24 June 2016 at the Africa Championships. The World Championship bronze medalist over 1500m has already raced the metric mile once in 2018, clocking 4:23.26 in Tshwane on 03 February. Not much should be read into this performance though, especially after her blistering 2:35.43* SA 1000m record. Scott has raced the 1500m twice this season on the indoor circuit where she first ran a national record of 4:05.25 (Boston, 10 February) and 4:09.81 (Birmingham, 2 March). That 4:07.25 lowered her previous national record by 3/10th from 4:10.90. The indoor track is very different to running outdoors which makes it difficult to extrapolate how good the 1500m indoor time is in comparison to the outdoors. With no pace maker, Semenya will have to do the work herself. She will need to go through the 300m mark in around 46-48sec, the 400m in roughly 62-64sec with 2:08 targeted for 800m if she hopes to break the record. A tough ask for someone to do on their own. Semenya is raw speed, while Scott seems to get better as the race progresses, making the 1500m an exciting tussle. 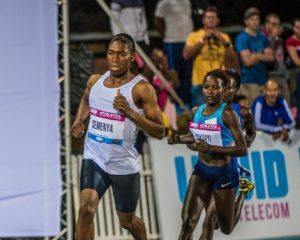 Semenya will be seeking an 800m/1500m double at the National Championships, a feat she last achieved in 2016, where she also won the 400m title.